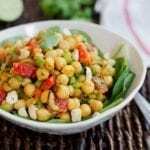 This curried chickpea salad is loaded with crunchy veggies and seasoned with traditional yellow curry. It makes for a filling lunch served over greens! And this curried chickpea salad is no different. I’m obsessed with it and so is Isaac. We’ve literally made it 4-5 times in the last few weeks. The thing about curry powder is that you don’t have to add much. A little goes a long way because it’s so flavorful. This salad is a winner because it’s amazingly easy to toss together. If you use canned beans there’s no cooking involved — just a bit of chopping. 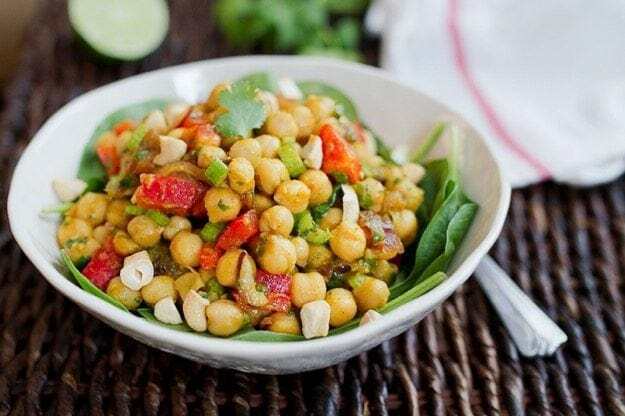 The chickpeas are filling and loaded with fiber, the veggies add a nice little crunch, you get a hint of sweetness in each bite from the dates and everything is covered in a curry dressing. What more could you ask for? Oh, cilantro? No worries! It’s got that too! 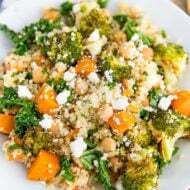 Combine all the dressing ingredients (oil, lime juice, apple cider vinegar, curry powder, maple syrup, salt, turmeric and garam masala) in a large bowl. Add chickpeas, celery, red pepper, dates, red onion and cilantro to the bowl and stir to combine. 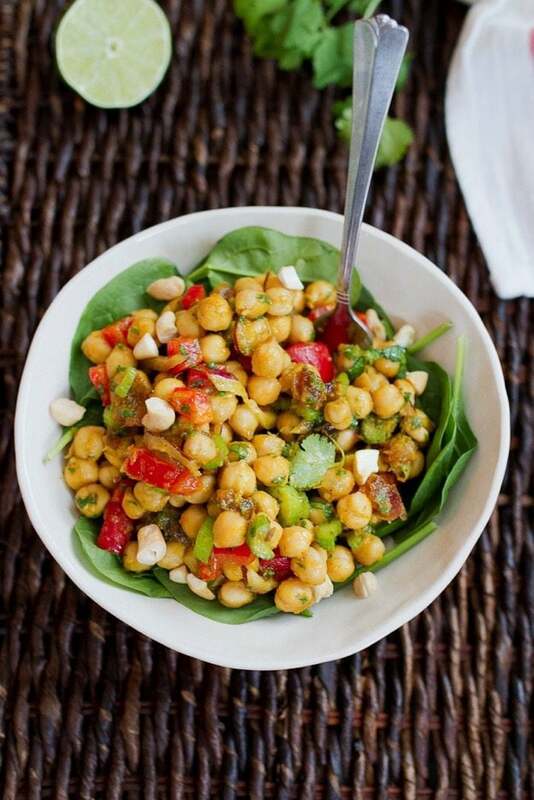 Serve chickpea salad on a bed of spinach or spring mix and top with cashews, if using. 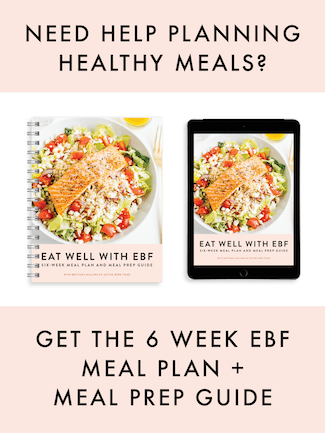 If you get a chance to try this recipe I’d love to hear what you think! Please leave a comment and a star rating below. It helps me and other readers who are thinking about making the recipe. 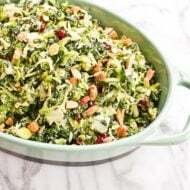 This salad looks amazing! Thanks! Thanks Andrew. I have a feeling you will love it! This looks delicious! 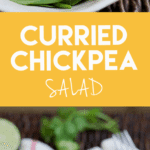 I’ve been on a major chickpea kick lately! I hope you had a great new year, Brittany! This looks totally amazing. I will definitely be making this very soon. Thank you so much for the recipe. So true, a little curry powder goes a long way! Love, love, love curry flavors. This salad looks like perfection, thanks for sharing! Hi! This looks so yummy!! Perfect combination of textures and flavors. Love that you added dates for a sweet kick with the curry! 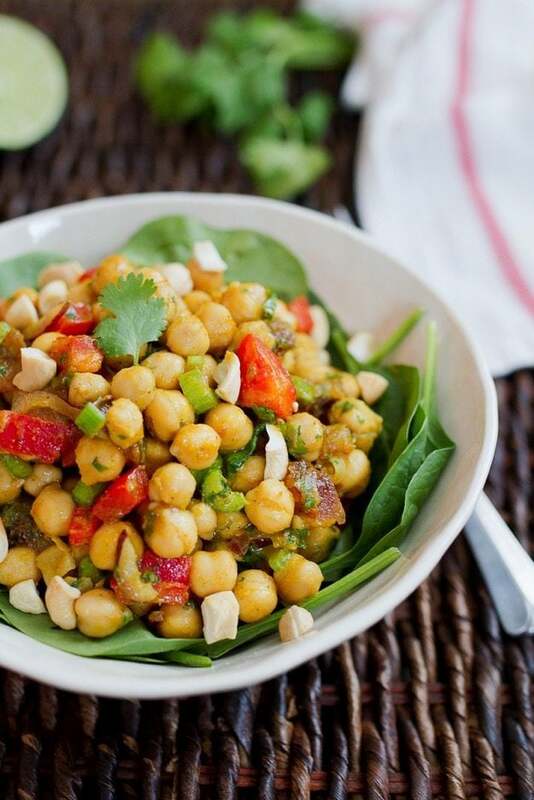 Being a fellow Indian food lover – this curried chickpea salad sure is a winner indeed! I made this recently and absolutely loved it! 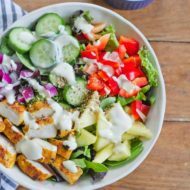 As a runner, I’m always looking for healthy and delicious lunch options and this sure fits the bill. Yay!!! I’m so glad that you loved it, Diana. I made the curried chickpea salad and served it with brown rice and spinach last night. It was absolutely delicious and all three of my teenagers ate every bite. Can’t wait to try more recipies! I made this salad for dinner last night. For the dressing I added about 2 tbsp. of sesame tahini, adjusted the curry just a bit for a more subtle flavor, no masala cuz I didn’t have any in my pantry, left the vinegar out and added more lemon juice, sub the dates with dry cranberries, added baby spinach. Result was superb! Hubby loved it! This was so yummy! I didn’t have curry powder on hand so I left it out and it was still super tasty! Pinned! Will be making it again!